Papers must be original and may be submitted in Spanish, English or Portuguese, covering theoretical or empirical aspects, preferably both them; they should aimed to be useful in designing public policies, and related to substantive central banking topics as established in CEMLA’s Statutes Article 4, that is a) monetary stability and related aspects, such as exchange rate regimes and management, monetary policy and liquidity management; b) financial stability and related aspects, such as deposit guarantees, the role of lender of last resort, the design and operation of payment systems, and bank regulation; c) regional and international coordination in the above areas and aspects, and in other areas such as the international financial system, debt and reserve management, and harmonization of banking practices and statistics. For all purposes, a paper is considered as original if it has not been previously edited and or published, neither in process to be published or being refereeing for another journal or book (in any format, be it printed or electronic). In addition, Working papers or research reports that are part of an institutional series (be it printed or electronic), or that are available at the internet in researcher networks, data bases or personal webpages will be also considered as original papers. In any other case, the Editorial Committee will decide if a particular paper is regarded as original or not. Articles sent for publication must not be submitted for consideration to another journal or book (be it printed or electronic) until the process of selection in Monetaria has been completed (i. e., the papers rejection or publication). Articles should be sent to the following e-mail address: monetaria@cemla.org. They must also comply with the requirements described in the “Instructions for authors”. 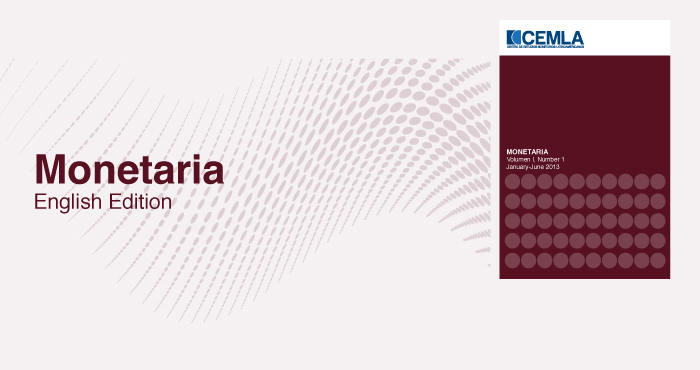 Monetaria is indexed at EBSCO and RePec (Econpapers).